The Grand-Daddy of all adhesives. Recognized by its distinctive gold, brown and red can with the famous Lion logo. This cement was the leader of our industry in the 1930s,1940s and 1950s. During the late 1950s the use of All-Purpose cements became necessary because of the change in the materials used in the manufacturing of shoes. However, #8 Rubber Cement has retained its popularity in the orthopedic field and is used by shoe repairers to make inside the shoe repairs. #8 Rubber Cement has also gained popularity in the sporting goods industry. Many sports equipment manufacturers use this quick drying, colorless adhesive in the manufacturing of equipment such as golf clubs and tennis racquets. #8 Rubber Cement is available in gallons, 5 gallon pails and 55 gallon drums. The shoe repair industrys most popular All-Purpose Cement. A quick drying cement popular for its fast set up and its strong waterproof bond. Used by the shoe repair industry since the 1950s, it remains the most popular and requested All-Purpose Cement in the United States. Master All-Purpose Cement is available in quarts, gallons, 5 gallon pails, 55 gallon drums and the handymans favorite, 2 oz. tubes. A strong bonding, waterproof adhesive which fills the need for work requiring a long set up time. The same strength as Master All-Purpose Cement, in a slower drying formula. Petronios All-Purpose Cement is available in gallons, 5 gallon pails and 55 gallon drums. All-Purpose Cements. Use only Petronios #8 Rubber Cement Thinner with Petronios #8 Rubber Cement. The best instant spray shine in the world! A fast-drying, instant high-gloss shine. Made for the shoe repairer in a 13 oz. aerosol can. Also available as a retail item in a 7 oz. can. Will not stain. The worlds best instant spray shoe shine is now available in a French/Canadian label. 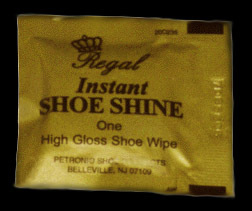 Regal Shine is now available as handy wipes. Excellent on-the-go shoe shines. 3 Wipes per Blister Pack  12 Blister Packs per Clip Strip  Case 60 Clip Strips.